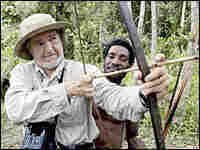 Jared Diamond: The Rise and Fall of Civilizations Jared Diamond is the Pulitzer Prize-winning author of Guns, Germs and Steel, which has been made into a documentary that debuts Monday. He discusses his ideas about the rise and fall of human civilizations. Preview the National Geographic documentary series. A new, three-part National Geographic series called Guns, Germs and Steel debuts Monday night on PBS. Based on the Pulitzer Prize-winning book by Jared Diamond, the presentation looks at why some civilizations have risen faster than others. The presentation begins in Papua New Guinea, and then follows Diamond, who is a professor of geography at the University of California, Los Angeles, as he travels to the Fertile Crescent and across the globe in search of the root cause of economic and political inequality. His answer? Geography. Some civilizations grew in locations favorable to agriculture, allowing them to develop technologies and social institutions to overtake others. Germs also played a role in history, decimating some populations with diseases to which others were immune. Diamond argues this is how Eurasians came to dominate the world. This year, Diamond published a book that looks at the demise of civilizations. Collapse: How Societies Choose to Fail or Succeed examines, among others, the disappeared cultures of Easter Island, the Anasazi, the Mayans and the Greenland Vikings. He begins this historical survey at a place far less exotic than New Guinea: a farm in Montana. Norse Greenland is just one of many past societies that collapsed or vanished, leaving behind monumental ruins such as those that Shelley imagined in his poem "Ozymandias." By collapse, I mean a drastic decrease in human population size and/or political/economic/social complexity, over a considerable area, for an extended time. The phenomenon of collapses is thus an extreme form of several milder types of decline, and it becomes arbitrary to decide how drastic the decline of a society must be before it qualifies to be labeled as a collapse. Some of those milder types of decline include the normal minor rises and falls of fortune, and minor political/economic/social restructurings, of any individual society; one society's conquest by a close neighbor, or its decline linked to the neighbor's rise, without change in the total population size or complexity of the whole region; and the replacement or overthrow of one governing elite by another. By those standards, most people would consider the following past societies to have been famous victims of full- fledged collapses rather than of just minor declines: the Anasazi and Cahokia within the boundaries of the modern U.S., the Maya cities in Central America, Moche and Tiwanaku societies in South America, Mycenean Greece and Minoan Crete in Europe, Great Zimbabwe in Africa, Angkor Wat and the Harappan Indus Valley cities in Asia, and Easter Island in the Pacific Ocean (map, pp. 4-5). The monumental ruins left behind by those past societies hold a romantic fascination for all of us. We marvel at them when as children we first learn of them through pictures. When we grow up, many of us plan vacations in order to experience them at firsthand as tourists. We feel drawn to their often spectacular and haunting beauty, and also to the mysteries that they pose. The scales of the ruins testify to the former wealth and power of their builders -- they boast "Look on my works, ye mighty, and despair!" in Shelley's words. Yet the builders vanished, abandoning the great structures that they had created at such effort. How could a society that was once so mighty end up collapsing? What were the fates of its individual citizens? -- did they move away, and (if so) why, or did they die there in some unpleasant way? Lurking behind this romantic mystery is the nagging thought: might such a fate eventually befall our own wealthy society? Will tourists someday stare mystified at the rusting hulks of New York's skyscrapers, much as we stare today at the jungle-overgrown ruins of Maya cities? It has long been suspected that many of those mysterious abandonments were at least partly triggered by ecological problems: people inadvertently destroying the environmental resources on which their societies depended. This suspicion of unintended ecological suicide -- ecocide -- has been confirmed by discoveries made in recent decades by archaeologists, climatologists, historians, paleontologists, and palynologists (pollen scientists). The processes through which past societies have undermined themselves by damaging their environments fall into eight categories, whose relative importance differs from case to case: deforestation and habitat destruction, soil problems (erosion, salinization, and soil fertility losses), water management problems, overhunting, overfishing, effects of introduced species on native species, human population growth, and increased per-capita impact of people. Those past collapses tended to follow somewhat similar courses constituting variations on a theme. Population growth forced people to adopt intensified means of agricultural production (such as irrigation, double-cropping, or terracing), and to expand farming from the prime lands first chosen onto more marginal land, in order to feed the growing number of hungry mouths. Unsustainable practices led to environmental damage of one or more of the eight types just listed, resulting in agriculturally marginal lands having to be abandoned again. Consequences for society included food shortages, starvation, wars among too many people fighting for too few resources, and overthrows of governing elites by disillusioned masses. Eventually, population decreased through starvation, war, or disease, and society lost some of the political, economic, and cultural complexity that it had developed at its peak. Writers find it tempting to draw analogies between those trajectories of human societies and the trajectories of individual human lives -- to talk of a society's birth, growth, peak, senescence, and death -- and to assume that the long period of senescence that most of us traverse between our peak years and our deaths also applies to societies. But that metaphor proves erroneous for many past societies (and for the modern Soviet Union): they declined rapidly after reaching peak numbers and power, and those rapid declines must have come as a surprise and shock to their citizens. In the worst cases of complete collapse, everybody in the society emigrated or died. Obviously, though, this grim trajectory is not one that all past societies followed unvaryingly to completion: different societies collapsed to different degrees and in somewhat different ways, while many societies didn't collapse at all. From Collapse: How Societies Choose to Fail or Succeed by Jared Diamond, copyright (c) 2004. Reprinted by arrangement with Viking, a division of Penguin Group (USA) Inc.